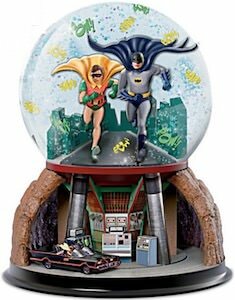 Now there is an amazing looking Batman And Robin And The Batcave Snow Globe. The Batman snow globe is based on the classic 1966 TV series. In the glass globe you can find Batman and Robin running with their capes flying in the air and when you shake it there is snow and typical words like Bang!, Pow!, and Zap!. The globe is placed on top of the Batcave and you can look inside and you can also find the Batmobile with Batman and Robin driving in and out as it will be going round and round which makes this really amazing. If you like the classic Batman TV series and would like a cool clock then look no further as this is an amazing Batman cuckoo clock. The clock is shaped like the Batmobile and has a clock face that shows Batman and Robin and on the hood of the car, it has the classic Batman logo. And this is a cuckoo clock but there is no bird but every hour the lights on the hood and back go on and there is some Batman sound too. 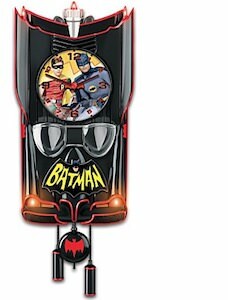 Before you will get his wall clock you have to be a true Batman fan because otherwise, the true fans will be out of luck as it is a limited edition item. If you like Batman and cookies then you just need this Batmobile cookie jar for when you have some cookies left that need storing in style. The cookie jar looks just like the real Batmobile only Batman and Robin are not in it but the Batman logo can be found on the side. And if you remove the seats then you get to the cookie storage and there is plenty of space to store some of your favorite cookies as the car is 11.5 inches long. A Batman cookie jar like this can be part of your family for many generations as it is made to last and just looks amazing. 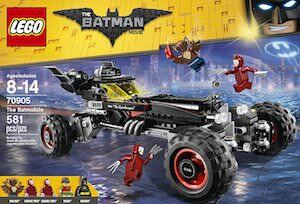 The LEGO Batman movie will bring the child in your and your kids alive because you can build it all from you own LEGO and then add this Batmobile just like in the movie. 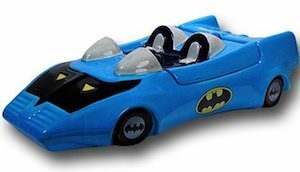 The LEGO set lets you build the exact car that Batman drives in the LEGO Batman Movie and then you can maybe even add some seatbelt. The LEGO set is number 70906 and has 561 pieces and is rated age 8 and up. Batman now can relive his adventures in your home or just sit neatly on a shelve. and yes LEGO Batman himself is included as well as Robin and other mini figures. Now you can build you own Batmobile and feel like Batman does. This is a model kit for a 1989 Batmobile and it is made from metal and just has to be assembled by you with some clippers and tweezers. No this Batman Batmobile is not black it is the color of metal but as it is build by you it surely looks even better then the real big one that Batman drives around. All build the Batmobile is 3.5 x 1.5 x 1 inch and I am sure it will look stunning on a shelve or maybe even in a display case. If you LOVE everything Batman then this is a collectors piece for you. A replica of the famous batmobile, of course belonging to one of DC Comics most prolific superheroes Batman, with immense deatil and attention to detail you will have this as a center piece to your collection for sure. 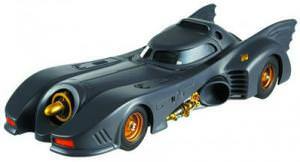 This is one of the most detailed Batman batmobile replicas you will ever find and this Hot Wheels Cult Classics 1989 Batmobile Die-Cast Replica is at a 1:18 scale.